If you’re looking for stylish flowers for a modern wedding, you have many beautiful blooms to choose from. Some of our favorites flowers for a modern wedding include those with an exotic look, but you can find modern wedding flowers that are classic and even playful. Modern wedding flowers can be found in most colors, so you can coordinate them with your décor and wedding attire. And, they’re available in many shapes and sizes, which means you’ll surely be able to find the perfect floral look for tabletop, hanging basket, or other display that you want at your nuptials. The following are some modern wedding flowers that we absolutely love. Take a look at these and let us know what you think. 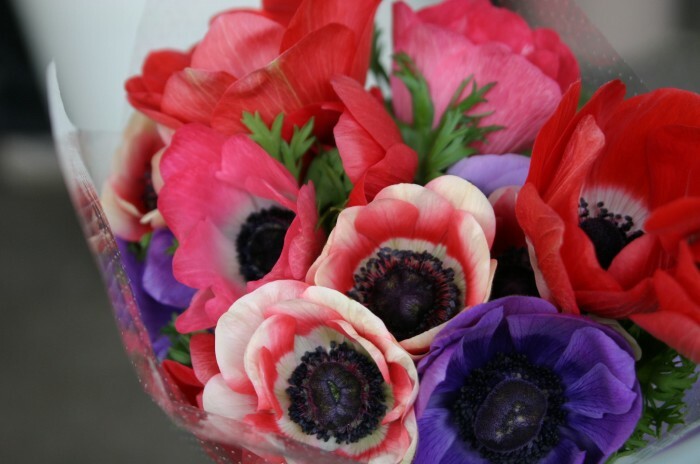 Dramatic poppy anemones look stunning in modern bouquets and as centerpiece flowers. They’re also perfect for making boutonnieres and flower girl adornments with. Anemones, with their inky centers, will give your wedding flowers a modern and ultra-luxe look. Because we love exotic flowers, we had to suggest an exotic bouquet filled some of our top blooms. For an exotic and contemporary wedding bouquet, or arrangement, create a floral mix of white phalaenopsis orchids, mini calla lilies, eggplant calla lilies, vanda orchids, and brunia berries in white, creamy, or slate shades. For a gorgeous modern look for an evening wedding, consider red bouquets and arrangements. We love red ranunculus tied together with a shiny black ribbon. As a variation, you can add orange or white ranunculus to your floral scheme. Bold colors are great for modern weddings, so consider vases and bouquets made with fuchsia peonies and bright sweet peas, mixed with angel grass. Bind these beauties together with a luxurious French ribbon in silver or gold. There are so many flowers that offer a modern and elegant look for a wedding, and even for a wedding rehearsal dinner or bridal shower. You can choose pink peonies, purple orchids, and many other blooms that will give your affair the contemporary and chic look that you desire. If you have some ideas for modern wedding flowers that you’d like to tell our readers about, feel free to share in the comments below. If you’re looking for stylish flowers for a modern wedding, you have many beautiful blooms to choose from. Some of our favorites flowers for a modern wedding include those with an exotic look, but you can find modern wedding flowers that are classic and even playful.Modern wedding flowers can be found in most colors, so you can coordinate them with your décor and wedding attire. And, they’re available in many shapes and sizes, which means you’ll surely be able to find the perfect floral look for tabletop, hanging basket, or other display that you want at your nuptials.